VTT Technical Research Centre of Finland has developed an efficient synthetic biology toolbox for industry and research organisations. This toolbox enables, in an unprecedented way, engineering of a diverse range of yeasts and fungi. The toolbox comprises DNA parts which can be easily combined to create new biological systems. 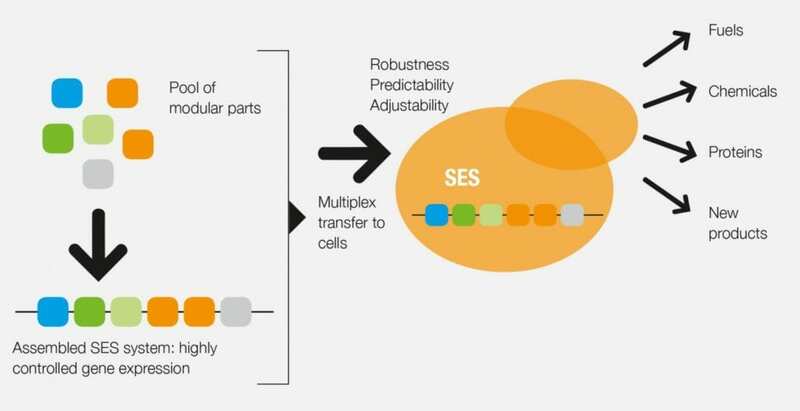 The SES (Synthetic Expression System) toolbox enables expression of genes in yeasts and fungi considerably more efficiently and with better control than has been possible with previous methods. The toolbox is based on DNA components with well-defined functions and the components can be combined as if they were Lego bricks. In this way, molecular machines can be built, for example, for improved control of yeast cell performance in industrial bioprocesses for production of polymer precursors, fuels and medical compounds. Because the components of the SES toolbox operate the same way in different species, they can be used to engineer species that have attractive properties, but which have due to lack of engineering tools not been studied or used in biotechnology applications in the past. The SES toolbox is expected to enable development of numerous novel microbial production processes for valorization of various waste materials to higher value compounds. In doing so, the SES toolbox provides important solutions for bio- and circular economy challenges. VTT Ltd is one of Europe's leading research, development and innovation organisations. We help our customers and society to grow and renew through applied research. The business sector and society in general benefit most from VTT when we solve challenges requiring world-class know-how together, and convert them into business opportunities. VTT in social media: Twitter @VTTFinland, Facebook, LinkedIn, YouTube and Instagram. For photos and videos, please visit our Image Bank.